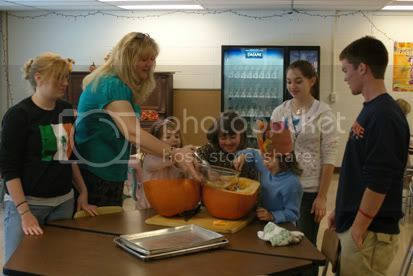 The Food & Nutrition class came into the elementary lunch room to ‘gut’ a pumpkin so they would have some seeds to bake. — that was the photographer’s interpretation. The Food & Nutrition class is demonstrating how a pumpkin pie is made from scratch. This is to show the students how the pilgrims cooked their food.